Brentford Football Club has confirmed the inking of an historic deal that will see London Irish Rugby Football Club move back to the capital and join the Club at Brentford Community Stadium. 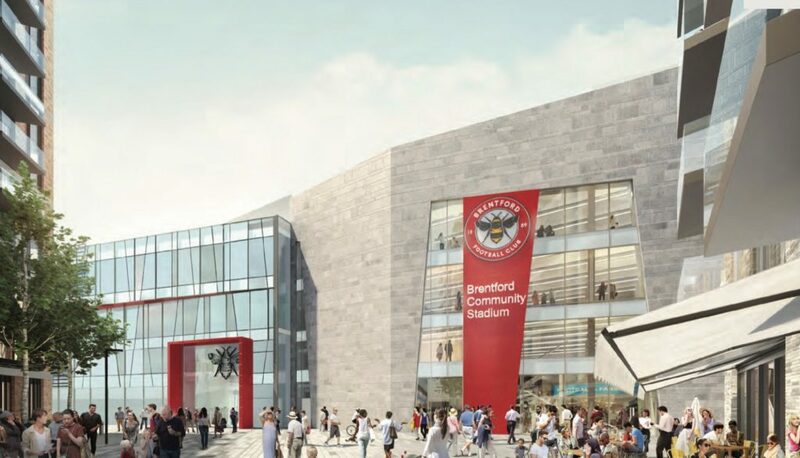 The Exiles have been playing at Reading’s Madjeski Stadium for two decades but will make a return to West London to play their games at the Brentford Community Stadium when it opens in 2020. The stadium is currently under construction and is on course for completion in 2020. Brentford FC and London Irish will play there from the 2020/21 season. The long-term agreement between Brentford FC and London Irish RFC was signed late last week. Under the deal, The Exiles have a licence to play at Brentford Community Stadium but Brentford FC have primacy of use. The stadium has been designed to host Premier League football and Premiership rugby, and will suit the needs of both clubs. Construction on the 17,250-seater stadium and associated development commenced in April with the Club’s development partner EcoWorld London, and its stadium subcontractor, Buckingham Group, and is progressing well. Key milestones have been satisfactorily achieved with significant parts of the steel frame and terracing in place. The steel frame for the south stand, the largest, is almost complete and work on the interior elements is progressing. Construction of the steel frame and terracing is now also underway for both the east stand and west stand. Work on the north stand is also expected to start in the next few weeks. The Brentford Community Stadium development is an important part of the wider regeneration of the area known as Brentford East. 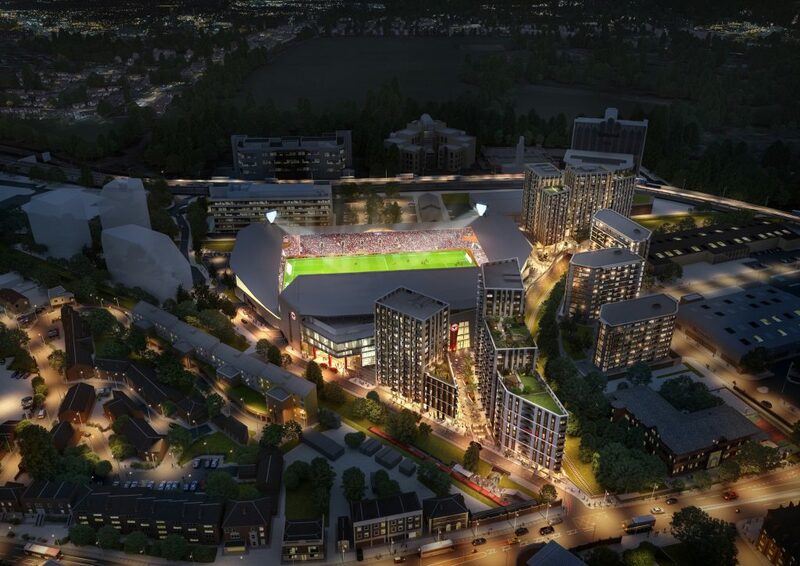 It will deliver a stadium together with more than 900 new homes, a new purpose-built location for Brentford FC Community Sports Trust, and a public square with shops and cafes. I’m delighted that we are now able to finally confirm that London Irish will play their matches at Brentford Community Stadium from the 2020/21 season. We are building a high-quality stadium fully equipped and ready from day one for the rigours and demands of both Premier League football and Premiership rugby. Like us, London Irish has a long history in the area and prides itself on having strong roots in the local community. We look forward to continuing to work with them over the coming months to support their successful return to the capital. It was always planned that the stadium would host rugby and we have been working on ensuring we have a top-of-the range pitch so both sports can be played. We believe that the deal with London Irish is a good one for Brentford FC both in terms of the fit between our clubs and the financial contribution that will help us to strengthen our on-pitch performance. We’re delighted to be moving to the new Brentford Community Stadium with Brentford FC. It has been a long-held ambition to return to our roots in West London, and this stadium has everything we need – location, capacity and facilities – to re-establish ourselves as London’s authentic top-flight rugby club. We can’t wait to start playing there! I am delighted to hear the announcement that London Irish’s new home will be the new Brentford Community Stadium currently under construction. This is great news for the borough, we now not only have an excellent football club in Brentford, we will also now have a fantastic rugby club in the borough too – both with top tier ambitions. Both clubs also have the local community at their heart and provide excellent community services for local residents, particularly encouraging young people to take part in sport. I am sure their involvement in the borough will go from strength to strength when the new stadium is open in 2020. I would like to wish both Brentford and London Irish every success for the future. Brentford Community Stadium is also set to play a hosting role, after it was announced England will stage the UEFA Women’s Euro 2021 finals. England was confirmed as hosts by the UEFA Executive Committee on 3 December, with the stadium being one of the nine proposed venues. The prestigious continental championship will, subject to final approval, be played at eight stadiums across the country, including Brentford’s, before concluding with a showpiece final at Wembley Stadium. With a strong bid to bring the tournament back to this country for the first time since 2005, no other countries went up against the Football Association’s entry. It means England will qualify automatically for the 16-team finals as hosts. The FA’s decision to bid was part of its ‘Gameplan for Growth’ strategy to grow the women’s game, and followed the successful Euro 2017 campaign in the Netherlands, which saw the Lionesses reach the semi-finals, generating a record peak audience of four million TV viewers in the UK. The bid proposes a spread of host cities and stadia of varying capacities, a year after hosting the equivalent final for the men’s tournament at Wembley. Since the initial bid, two of the venues have been changed as a result of UEFA requirements. Bringing Euro 2021 to England will be a tremendous opportunity to celebrate women’s football and will allow us to amplify our significant commitment to growing the game. In January, we pledged an additional £50m investment over the next six years and grassroots initiatives like our popular SSE Wildcats scheme for 5-11-year-old girls has seen the number of centres more than quadruple over the past year to 880. We cannot underestimate the positive impact this tournament will have on inspiring the next generation. Young girls and boys will be lifted by the chance to see Europe’s elite on their doorstep and it can only help the collective effort across our leagues and clubs to grow the game even further, especially with our restructured FA Women’s Super League making such a promising start. I am grateful to Aleksander Ceferin and the UEFA Executive Committee for recognising the work we are doing. We are determined to put on a great showcase with Europe’s top talent playing in front of packed stadiums. To have Wembley for the showpiece final will be a fitting conclusion to what I am certain will be a wonderful tournament. I would also like to thank everyone who has worked on this successful bid, not just across The FA but also the clubs and cities concerned. A huge amount of effort and collaboration has gone into making this possible. With the World Cup next summer in France, there is plenty to look forward to in the women’s game. It is a great honour to have been chosen as a proposed venue for the UEFA Women’s EURO 2021 tournament. We are building a stadium that we believe will be a great home for Brentford FC and it is great to see it rising so quickly. There is a lot more work for us to do before we can host these games but this is a great boost for the project. The FA’s bid has the full support of the UK Government. England previously staged UEFA Women’s Euro 2005 at venues across the north-west of the country with 29,092 watching England’s opening win against Finland in Manchester a record for an opening group match. Earlier this year, St. George’s Park and stadiums across the Midlands and South Yorkshire hosted the UEFA Men’s Euro U17, while Wembley Stadium will be a key venue when UEFA Euro 2020 is played across 12 European cities. 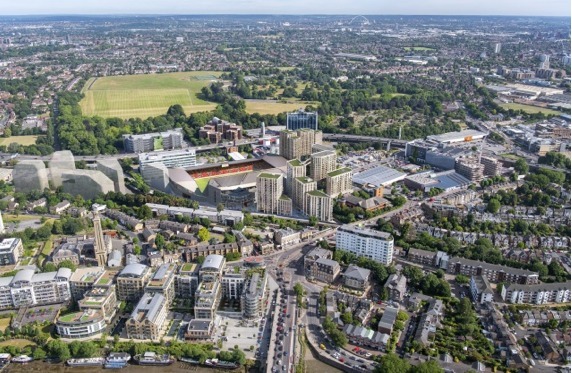 Brentford Football Club will move from its existing stadium at Griffin Park to a new purpose-built community stadium on Lionel Road, adjacent to Kew Bridge railway station. AFL Architects won a limited design competition to design a new 17,250-seat stadium and hospitality facilities for 2,930 people. The stadium is part of a residential masterplan, including a community sports trust adjacent to the stadium as well as 910 residential units. This proposal will kick-start the regeneration of Brentford and bring numerous opportunities to the local community. The stadium will provide a forward-looking venue, which will provide compliant facilities for Premiership Football and Rugby Union.